The beginning of a Hong Kong saga based on a comic book, this film would mark the breakout roles for some of the big talents of the 1990s in Hong Kong. The Hung Hing Triads are one of the most righteous gangs in Hong Kong. Unless necessary, they do not cause trouble intentionally. A group of friends have followed one of the head bosses, Uncle Bee, for ten years and are his best underlings. They are Chan Ho-Nam, Chicken, Dai Tin-Yee, and brothers Pou-Pan and Chou-Pan. When they are ordered to kill a rival named Babai, they almost are unsuccessful due to a power failure that causes Chicken to get stuck in an elevator with the weapons. However, in the nick of time, Chicken arrives and makes the final kill on Babai. This angers Ugly Kwan, the “bad seed” of Hung Hing, because of a failed debt. Kwan had always had it in for Bee and his boys. When he unsuccessfully tries to have Ho Nam follow him, he decides to set up the boys when they are assigned a job to go to Macau. When Chicken ends up with three women, the boys end up ambushed. Chou-Pan is killed and Ho Nam is kidnapped by Silly Keung and drugged along with Chicken’s girlfriend Ho-Yan. When Ho-Yan realizes what happened, this causes a rift between Ho-Nam and Chicken. Chicken decides to head for Taiwan and Kwan is made the new head of Hung Hing after a vote, replacing current leader Chiang Tin-Sung. However, Kwan goes too far when he kills Bee and his entire family. Upon hearing the news, Chicken returns as a member of another gang and reconciles with Ho-Nam. Together with the rest of the friends, they set out to stop Kwan once and for all. For those unfamiliar with Hong Kong comics, Cow Man’s Teddy Boy is the story of a righteous triad with a band of friends rising up the ranks from rascals to the eventual heads. Manfred Wong liked the story so much that he decided to make a film out of the series with the help of Wong Jing. Andrew Lau, a top cinematographer for Jing was chosen to direct and lens the film. 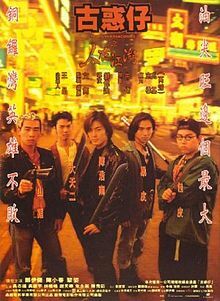 The result is a much underrated Hong Kong film that tells the story of five friends in the Triads and the obstacles they must overcome to avenge their boss as well as bring righteousness back to their gang. To show its origin from the comic book, the film intercuts the film with comic drawings at times. Even the introduction of the friends who lead the film are shown in comic book fashion. What’s great in this film is that the chemistry between the five leads is smooth and not forced. Ekin Cheng, Jordan Chan, Michael Tse, Jerry Lamb, and Jason Chu are all convincing in their roles and look like they could pass for five actual friends, especially with the way Lau shot certain scenes in documentary fashion with the use of a handheld camera. Frankie Ng, a former real-life Triad turned actor, is great as the friends’ boss and at times, father figure while Gigi Lai plays Ho-Nam’s eventual love interest who starts out quite bad when she steals Ho-Nam’s car and tries to extort him. Even their romance feels unforced and looks natural. Francis Ng gives out one of his best performances as Ugly Kwan, who is the bully and bad seed of the gang. While most of the other gangsters show a more level-headed way of doing things, Kwan truly personifies what a scumbag is capable of. He goes as far as trying to take Bee’s most respected rascal to join his ranks and when that fails, he plans a major set-up. He really doesn’t care about anyone about himself and has to go to great lengths to gain his power, even taking things on a personal level. He nearly steals the show in his role of Kwan while Simon Yam makes quite the cameo as Hung Hing lead boss Chiang Tin-Sung. Young and Dangerous is a great mid-90’s Hong Kong film that revolves around loyalty, friendship, and righteousness within the Triads, with Ekin Cheng, Jordan Chan, Michael Tse, Jerry Lamb, and Jason Chu in breakout roles and Francis Ng in a virtually show-stealing role as the villain. A Jing’s Production Limited production in association with Art Top Movie Productions. Director: Andrew Lau. Producer: Manfred Wong. Writer: Manfred Wong; based on the comic “Teddy Boy” by Cow Man. Cinematography: Andrew Lau. Editing: “Marco”. Cast: Ekin Cheng, Jordan Chan, Jerry Lamb, Michael Tse, Jason Chu, Francis Ng, Gigi Lai, Frankie Ng, Simon Yam, Spencer Lam, Suki Chan, Dion Lam.